The Chisholm Trail was a trail used in the later 19th century to drive cattle overland from ranches in Texas to Kansas railheads. The trail stretched from southern Texas across the Red River, and on to the railhead of the Kansas Pacific Railway in Abilene, Kansas, where the cattle would be sold and shipped eastward. 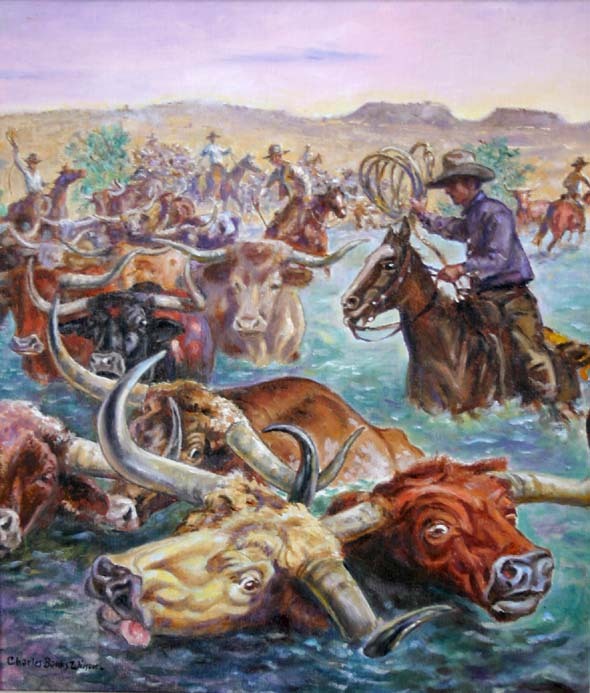 Today, most historians consider the Chisholm Trail to have started at the Rio Grande in Texas or at San Antonio, Texas. From 1867 to 1871, the trail ended in Abilene, Kansas. Later, Newton, Kansas, and Wichita, Kansas, each served as the end of the trail. From 1883 to 1887, the end of the trail was Caldwell, Kansas. Ellsworth, Kansas is also considered a major influence of the trail. In Texas, there were hundreds of feeder trails heading north to one of the main cattle trails. In the early 1840s, most cattle were driven up the Shawnee Trail. The Chisholm Trail was previously used by Indian hunting and raiding parties; it went north from Austin through Waco and Fort Worth. The trail crossed into Indian Territory (present-day west-central Oklahoma) near Red River Station (in present-day Montague County, Texas) and entered Kansas near Caldwell. Through Oklahoma, the Chisholm Trail generally followed the route of US Highway 81 through present-day towns of El Reno and Enid. On the long trips – up to two months – the cattlemen would face many difficulties. They had to cross major rivers like the Arkansas and the Red, and innumerable smaller creeks, plus the topographic challenges of canyons, badlands, and low mountain ranges. The weather was less than ideal. In addition to these natural dangers, there were rustlers and occasional conflicts with Native Americans if a trail boss failed to pay a toll of 10 cents a head to local tribes for the right to cross Indian lands (Oklahoma at that time was Indian Territory, governed from Fort Smith, Arkansas). Finally, there was the natural contrariness of the half-wild Texas longhorn cattle themselves, which were prone to stampede with little provocation.